Auch bekannt als: Remote Environment Monitoring System, monitor networking closets, server room alert, IP temperature sensor, humidity sensor, computer room humidity probe. (Coming Soon) Optional intuitive graphical management software provides an easy-to-use, unified interface for both monitoring and configuring up to 3,000 ENVIROMUX units and all connected sensors. One female Micro USB connector for connecting a USB Modem. HTTP/HTTPS, SNMP V1/V2c, SMTP, TCP/IP, Syslog, SNTP, DHCP, SSLv3, AES 256-bit, 3DES, Blowfish, RSA, EDH-RSA, Arcfour. Email alerts are not compatible with TLS. SMS alerts can be sent to 2 numbers. ±0.72°F at -14 to 167°F (±0.4°C at -10 to 75°C). ±0.9°F at -4 to 23°F (±0.5°C at -20 to 5°C). WxDxH in (all options): 4x3.44x1.37 (102x87x35 mm (4x3.4x1.4 in)). Includes one country-specific AC adapter. The second AC adapter is sold separately (PWR-SPLY-EMICRO). Country-specific AC adapters sold separately (PWR-SPLY-EMICRO). Operating & Storage Relative Humidity: 0 to 99% non-condensing RH. 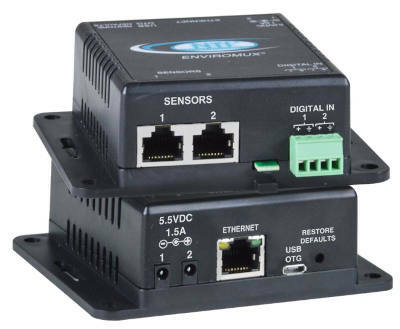 Optional intuitive graphical management software provides an easy-to-use, unified interface for both monitoring and configuring up to 3,000 E-MICRO, E-2D/5D/16D, E-SEMS-16(U), IPDU-S4/8 units and all connected sensors. E-TRHM-E7 Temperature/Humidity Combination Sensor, 7 ft, Includes RJ45 Coupler to Extend up to 500 ft.